It's important to select the right down pillow sizes for your body and sleeping preferences rather than to match the size of your bed to avoid aches and pains in the morning. According to your body measurements a pillow should maintain a height of 4 to 6 inches, properly supporting the head and neck. Save money and purchase two pack down pillows. You'll have two pillows that match perfectly -- one for each side of the bed. If you share your bed and your partner doesn't share the same pillow preferences as you the extra pillows on your bed will add luxury and comfort. The extra pillows come in handy when reading, watching TV or to place under your knees or waist. Buy pillows separately or save money and buy in sets of two or four. Equally important is your sleeping position when considering the firmness of your pillow and down pillow sizes. Pillows are intended to support your neck and head to alleviate pressure points. 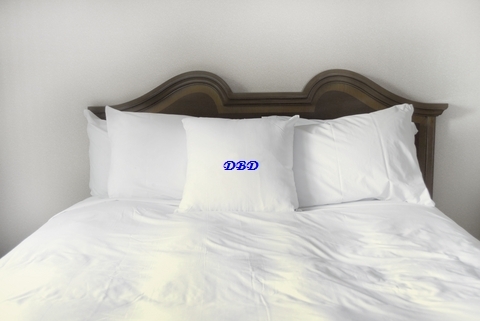 Down pillows are great because they can be adjusted to fit the unique shape and curves of your body in various sleep positions. ... on your back : You should get a medium down pillow to rest your head and neck supporting the natural curves of your spine. The thickness of your pillow should be less than if you were sleeping on you're side but not flat. Placing a pillow or two beneath your knees further alleviates any back strain, and is the gentlest position for your back. ... on your side : Your down pillow should be firm to support your head and neck but rest just above your shoulders so that your spine maintains a straight and natural horizontal line. Your weight should be evenly distributed to prevent unnatural bending or pressure. Some people may enjoy placing a small pillow or rolled up towel, or even curling up excess blanket under their waist or between your knees for additional support. ... on your stomach : Your down pillow should be soft and relatively flat, or the head should rest directly on the mattress, so that the head and neck aren’t turned unnaturally to either side. In this position, it is often best to place another relatively flat pillow under the stomach to help the spine keep its natural alignment. Director of the UK Sleep Assessment and Advisory Service, Professor Chris Idzikowski studied sleep positions and personality and found that our sleeping positions reflect our personalities. Check the chart to see where you fit in and if your personality matches your position. Whatever your needs and sleeping preferences, there's a goose down pillow out there just for you. If you shop online you will certainly find the down pillow sizes that fit just right with you. Return from this down pillow sizes page to the Down Bedding Delights home page.